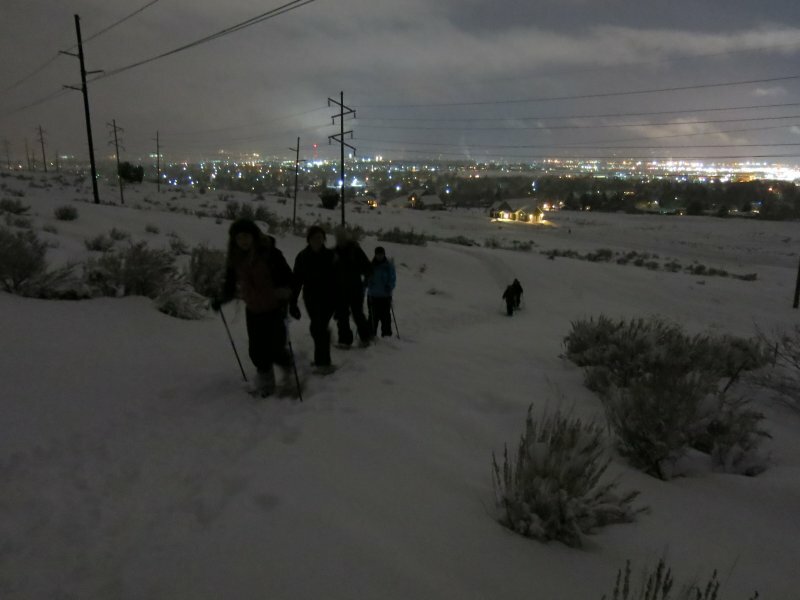 This trip was scheduled for Temple Fork, but a major winter storm and treacherous road conditions prompted us to go to the Bonneville Shorline Trail instead (this trail roughly follows the "Bonneville Bench", a feature of the ancient Lake Bonneville that occupied much of northern Utah during the ice ages). 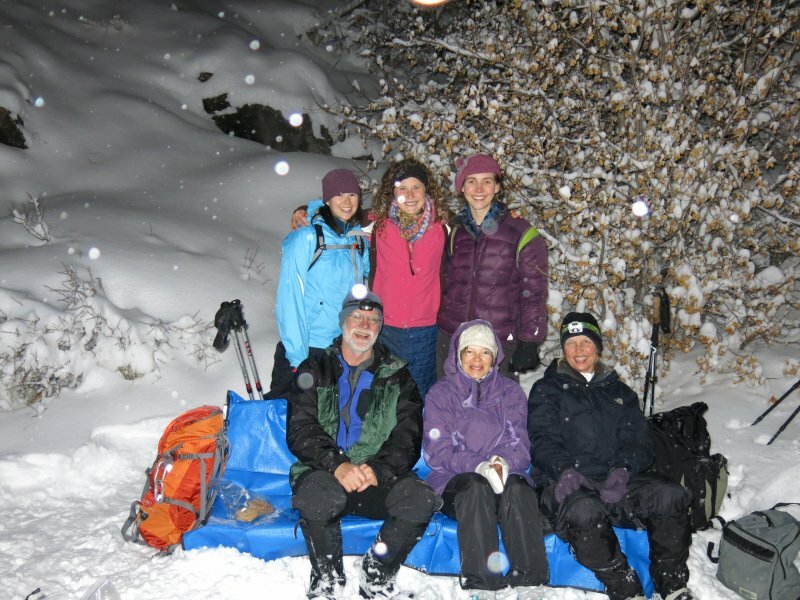 Seven people joined this night-time event: Dave W. (the trip leader), Jane, Stephanie, Alex, Anna, Alexi and Jeanne. As usual, Dave was on skis, and everyone else used snowshoes. We met at 6:00 pm in Logan, and carefully drove on slick roads to the Bonneville Trail at the mouth of Green Canyon. A thick layer of new snow blanketed the the terrain, obscuring the trail and requiring extra effort by the lead person to "break trail" (although Dave said it was the best snow his skis have been on all season). It was snowing, but there was enough moonlight filtering through the clouds to allow us to travel without using our headlights. Then, at 7:40, a hole momentarily opened up in the clouds and we were treated to a direct, unobstructed view of the moon! We followed the path of the Bonneville Trail as closely as possible, eventually arriving a turn-around point overlooking the golf course. A bench along the trail served as a rest stop and a good place to enjoy snacking on Stephanie's homemade "moon cookies" and Dave's (purchased) "Moon Pies". On our return to Green Canyon we saw fresh deer tracks following the trail we had broken through the deep snow. The snowfall was much lighter by then, allowing views over Logan and across the valley. The trip totaled 3.1 miles, with about 500 feet of up-and-down. The moon had 97.1% illumination, with moonrise at 4:26 PM (full moon will be Feb. 25, two days after this trip). 3.1 miles, with 500 feet of up-and-down!